Hi… I am just wondering if there is any plan to install a property drivers ( nvidia , ati and so on… ) with easy way on antergos like ubuntu doing. It is not easy to detect nVidia Optimus video cards and install correct packages for them. Cnchi currently does not do that (more is here). No problems were reported for other cards. Thanks for your reply. At the beging of installation as you say maybe it is not easy. But how about to do it after installing antergos with special apllication. Here is the link of video how installing property driver on ubuntu. Please dont understand me wrong i am not comparing antergos with ubuntu. If i like ubuntu i would use it. Only it was a good feature that i like. 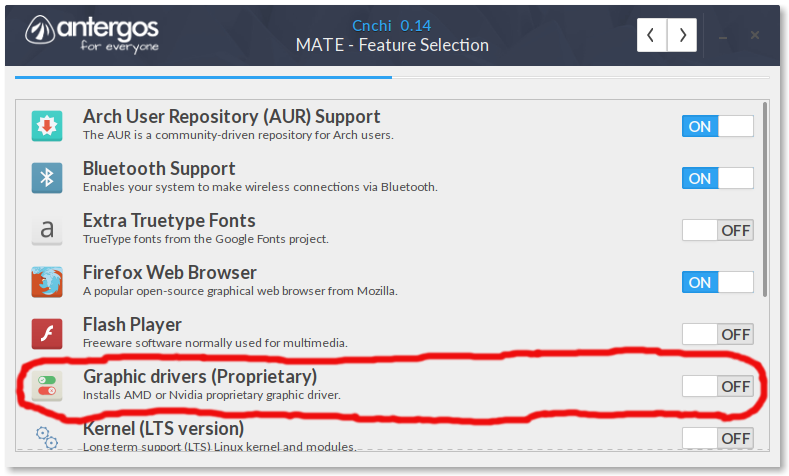 Anteros does not offer proprietary video cards drivers instllation method different from an initial installation with Cnchi.